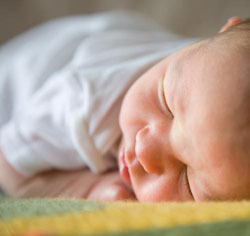 The season of change is upon us, and with it are a number of factors that might affect your baby’s sleep habits. In the United States we have daylight savings changes, which move the clock forward in springtime and backward in fall. Gaining an extra hour this fall seems like a great idea, right? Until you consider the fact that circadian rhythms have a major impact on sleeping patterns, which might have your little ones waking up an hour earlier in the morning. Ouch! 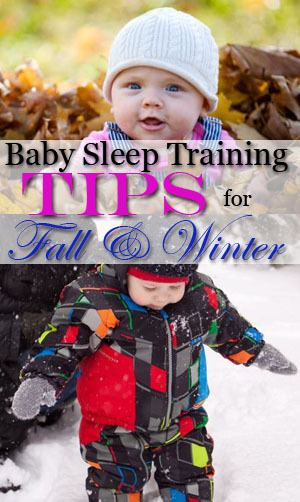 This article covers some of the seasonal changes in fall and winter, and how you can use them to help establish or continue healthy baby sleep habits. For me, the daylight savings time change in fall is a scary thing. Essentially it means that sunrise will come an hour earlier, and so will the songs of the despicable birds that congregate outside of our house. Both sunlight and natural noise conspire to wake my boys in the morning. We combat this by using room-darkening shades with heavy curtains, and providing white noise in the nursery with a crib soother or sound machine. Daylight savings is also an excuse to practice one of the most powerful techniques in baby sleep training: the early bedtime technique (EBT for short). The days are already getting shorter, so it’s a natural fit. The EBT will surprise you with how well it works in this transition period. Start adjusting for it now, so it’s not a shock when the clocks roll back. We try to put our boys to bed about an hour after dinner, which means we finish eating, play for half an hour, and then start getting ready. Dinner is the kickoff event for our nightly bedtime routine. Ever since the boys started eating solid food, we’ve focused on getting them a good nourishing dinner to help them sleep longer without waking up hungry. Break out the cute pajamas! In the case of swaddlers and sleep sacks, keeping baby from rolling around too much and waking up with a leg stuck in the crib’s bars. The soothing white noise of central heating is a plus as well; it’s hard to imagine that a soft flow of warm air into the nursery would have anything but a positive effect. Constructive activities like building blocks for babies of any age. A nice warm bath will do wonders – see our 7 tips for a perfect baby bath. Wash hands and use hand sanitizer religiously! If and when your little one catches a cold (it WILL happen), see our tips on getting a sick baby to sleep. Something about the colder weather makes me really want to snuggle a baby in a soft, overstuffed chair and read a book. There are plenty of good reasons to read to your baby; fall and winter are a great opportunity to engage in this “indoor” activity. Play time, settle down time, and a solid bedtime routine are the critical elements for good baby sleep habits in these changing seasons.